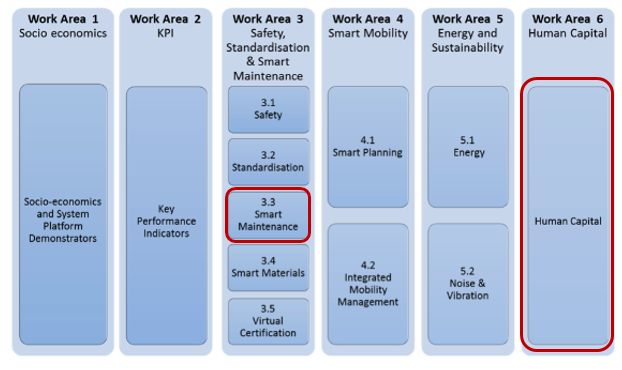 SMaRTE Smart Maintenance and the Rail Traveller Experience brings together two related but distinct areas of research. Smart maintenance and human factors are concerned with digitisation and the use of information to enhance decision making, either by industry players in respect of maintenance decisions, or by users of the system in employing smart applications to navigate the rail system and its interaction with other modes. Application of CBM model to two real-world case studies on train passenger components. Review of demographical and societal factors affecting transport use, usability and attitudes towards transport. Realize an Experience Map project, which considers passengers as individuals behaving in the real context while performing the activities to reach their prefixed objectives. Identification of the physical and planning factors and their relative importance in the journey to identify the resistance at each step of the journey, broken down by demographic groups and mode/journey purpose. Estimation of attrition factors for each activity in the journey, to quantify those potential customers lost at each step of the journey due to unfulfilled usability requirements. Integrate the outcomes of the research into a vision and roadmap of measures to simplify the end-user experience of planning and undertaking a trip that includes a rail journey. The human factors work links to Work area 6 of the CCA-Cross Cutting Activities in the S2R MAAP, Human Capital, which aims to bridge the gap between changes in the railway and other sectors imposed by rapid technological advances and substantial demographic change. Specifically within this work programme this call links to customer oriented design of mobility. The smart maintenance work links to work area 3 of the CCA-Cross Cutting Activities, specifically sub work area 3.3, Smart Maintenance.